What Makes a Free-to-Play Game Successful? This is an editorial by Aabicus which analyses the successfulness of free-to-play games in the gaming industry with relation to Team Fortress 2. All views expressed here are his own. The Free-to-play model is the current trend in multiplayer online games at the moment, most frequently seen in MMOs, MOBAs and shooters. Since several high-profile games (including Team Fortress 2) proved the model worked, the gaming industry have seen a staggering amount of F2P releases, some of whom keep their revenue-enhancing devices subtle and others who make real-world money the most valuable resource a player can have. Being a game developer myself, part of my job requires that I analyze the current market and determine what causes some games to succeed over others. As a fan of both Team Fortress 2 and Loadout, these games are quite easy for me to analyze because they share many similarities, yet intriguingly one has done significantly better than the other. A brief summation of Loadout: Released by Edge of Reality on January 31st, 2014, the game harkens to the classic arena shooters such as Unreal Tournament and Quake. As the name would suggest, the primary mechanic is earning the in-game currency “blutes” and purchasing a wide assortment of weapon parts, letting a player customize her loadout to a staggering degree. The premium currency, “Spacebux”, costs real-world money and can be used to buy cosmetic items, XP boosts, and extra slots to store the guns the player has constructed. However, despite being a cartoony customization-heavy shooter like Team Fortress 2 the game has consistently proven to be unable to hold more than a meager player base. 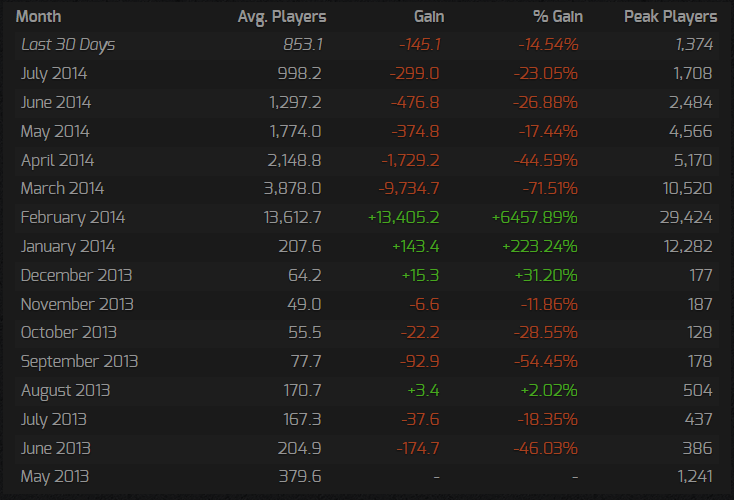 As of the time of this writing, Loadout has experienced a decrease in overall active players almost every month except the two succeeding its release. For ages, I couldn’t figure out why. The gameplay seemed quite nuanced, the developers active and attentive, the meta-game seemed to appeal to players of all strategic levels. The developers had made their stance very clear that they envisioned Loadout as “play to win, not pay to win”, and to that effect none of the items purchasable with real-world currency gave unfair game-play advantages. By my analysis, Loadout had done everything right. Then, quite recently, the Loadout developers announced that the game would be making some huge, sweeping changes to its core mechanics, changes mostly chronicled in this thread on the Loadout forums. MMO-style weapon drops with stat-altering rarities, character levels that grant gameplay bonuses, a playerbase-wide inventory wipe… for pretty obvious reasons, the majority of the community seems to be, at best, displeased with the new direction the game is going. The most intriguing part for me is the new role that Spacebux will fill; the player can now purchase “part packs” from the store, which grant the player a random assortment of weapon parts. These weapon packs, like the ones obtained in-game, have a chance of being rare or ultra-rare quality. This gives me an opportunity to see what Loadout thought it was missing. The main theme this new direction added to the game was randomness, especially a concept that should already be familiar to a TF2 audience: a form of gambling where the player can spend money to possibly obtain rare items. In Team Fortress 2 unlocking Mann Co. Supply Crates can give the player a rare unusual hat; in Loadout weapon packs might give the player items with superior stats explicitly labeled Rare or Ultra-Rare. Suddenly I see why Loadout is doing this. Loadout was completely missing this aspect, and that’s why it was failing as a Free-to-play game. Because there was no form of gambling, even for cosmetic items, there was no possibility for a player to be a “whale” to the extent a TF2 player can. In current Loadout, what you pay is what you get, meaning that the best Edge of Reality ever received were players like me, who said, “I want these four cosmetics,” bought said cosmetics, and then ceased to spend any money at all. While the new Loadout includes the needed gambling aspect, the huge mistake I’m seeing is that they tied it to in-game benefits. In Team Fortress 2, all these money finagles can get you particle effects and skins, but it can’t buy gameplay advantages. Loadout has chosen to sell performance bonuses instead of, say, Ultra-Rare gold weapon skins, and in addition is having to go wipe everyone’s backpack because these changes don’t fit what’s in the game right now. Not that this will cause the whole thing to fail; Gamasutra’s article about the plight and resurrection of Battlefield Heroes perfectly mirrors what Loadout currently faces, down to the most likely consequences of its new direction; current players will continue to be displeased, but the game as a whole will become more profitable and the developers will remain in business. I don’t mean to sound pessimistic nor critical of the Free-to-play model as a whole, but there are right and wrong ways to go about it. Team Fortress 2 itself is a prime example of a healthy game that is largely unaffected by the risk economy some players choose to dabble in. A gambling mini-game that runs on real money can keep free players happy, paying players happy, and developers happy. However, if a developer gives paying players unequivocal benefits, they may find that the free players composing 99% of the player-base will decide to play ball elsewhere.